iPhone 6: Main Disadvantage of iPhone 6 and why Apple failed? Apple, as it say “Think different”, has not made any difference in its newer version of iPhone 6 or iPhone 6 plus. Apple makes products that are never seen before. Every Year, in september, the world grabs a bag of popcorn and gets ready to watch Apple’s best iPhone yet come on stage in all its glory and packed with features that every privilege customer feels the premium of being Apple’s Customer. But this time, apple didn’t do anything except the bitter aftertaste the presentation left on millions of Apple’s fans. Things actually started off nicely with the announcement of the long overdue screen size bump, and we didn’t get a cheaper option this time – we were treated to possibly a bigger, better iPhone to go with the best iPhone to date. How Apple – it takes another iPhone to beat the iPhone. It felt though like they’re telling the audience, you don’t have to go to the competition to do better. We never thought we’d see Apple do that – imply that. We missed the usual arrogance if you will. The kind that preached that screens bigger than 4″ are a nonsense. The kind that insists on the retina resolution while the competition is at QHD. Rounded corners? 8MP camera? NFC? This must be year 2012. Apple’s not about cutting-edge hardware, but content and user experience. We’ve heard enough of that. And hey, it’s a valid strategy. 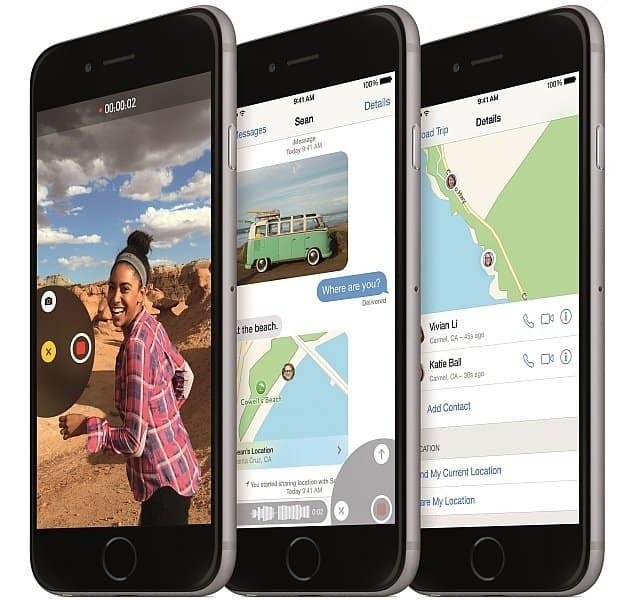 But this year even the most loyal iPhone users among us have a feeling they’re being fed a feature a year with Apple withholding significant upgrades that would make the iPhone technologically superior, or equal to the flagships of the competition. If it wasn’t for the different looks, we’d say all we got this September is another incremental upgrade, an iPhone 5s, if you will. And the looks – the phone looks gorgeous but once we picked it up, the slippery curves made us miss the sharp machined chamfered edges. Gone is the premium glass material on the back, replaced by cheap looking antenna strips that can’t seem to decide whether they belong to the back or the sides. Oh, and the protruding camera lens – bumper cases will be in high demand again it seems. Anyway, we’re here to see how much better the new iPhone 6 is compared to last year’s model and we can start with a look at its key specs. Who knows, we might succumb to its charms. Feel free to disagree – but the biggest upgrade Apple has delivered in years has left the feature gap wide open – denying them their usual excuse: “We do things our way, we don’t care about anyone else’s screen size or resolution”. And that list goes on to waterproofing, 4K videos, lossless video zoom, OIS, high-res imaging, stereo speakers. Perhaps we started this review off on the wrong foot, so please forgive us the rant. But the irony in it is that it was Apple’s iPhones driving the competition to heap feature upon feature in hope they can steal users from the superior ecosystem and user experience which, we must say, got even better with iOS 8. It now looks like Apple were wrong about screen size. They’re in a position to explain why it took them a couple of generations to catch up to the screen size of Android… minis – but still fail to match many of the intriguing features the competition has been offering. The Apple iPhone 6 is not without its merits. It’s just that this year you have to look even harder to spot them. We like how iOS looks and feels on a bigger screen. We love the curvature along the edges of the front glass. The new chipset is more power efficient and yet gets an edge on the 64-bit A7 chip in the iPhone 5s, both in terms of processing power and graphics rendering. It will be a tough battle, but we’re more than willing to give it a fighting chance. Smartphones like Samsung Note 4, Nexus 6, Sony Xperia Z3, Moto X 2nd Generation are the best competitors with an Optimum price tag. Only Premium branding couldn’t make lives more easy. It is the specifications and design makes life easy. But the fall of Apple has already started. And the recent Video #bendgate video has create great response among the users and this explains the lack of quality, Apple has imparted and it affected the trust among Apple users. And even, Instead of issuing an official response or pointing to the video of the test facilities or the low number of complaints, the company chose to stop working with the media, ban it from all its events and deny it review units in the future. Now we’re fully aware that each and every manufacturer has the right to choose the media outlets it works with as you can’t simply fit everyone wanting to attend in even the biggest halls. Just like anyone else who is obsessed with digital technology we have eagerly awaited the new iPhone. We felt relief when the head of our telecom department one day shouted “Here we go!”, presenting an invitation to the great event. And certainly we took a flight, went all the way to California, just to tell our readers every detail about the device that you and your company have worked on so hard for such a long time. When the iPhone 6 Plus finally hit the market we noticed a few reports on a possible problem. According to them the case seemed to be weak, “bendable”, to drop the evil word. Being popular for our tests with utmost scrutiny, we could not leave the subject without comment. Of course that required further tests since testing new products without any prejudice is our obligation to our readers. And so we bought an iPhone 6 Plus, just to find out whether it was a singular problem or some kind of hoax. The test was quite simple, so we could easily record it on video. Just to prove that what happens is nothing but the truth. Dear Mr. Cook: Is this really how your company wants to deal with media that provide your customers with profound tests of your products? Do you really think that a withdrawal of Apple’s love and affection could have an intimidating effect on us? Luckily we do not have to rely on devices that Apple provides us with. Luckily, a lot of readers are willing to pay money for our magazine to keep us independent. So we are able to buy devices to do our tests anyway. Even devices of manufacturers that seem to fear COMPUTER BILD’s independent judgment. Even if we are quite dismayed about Apple’s reaction, we won’t give up our principles: We will continue our incorruptible tests that have the same high reputation in the German media-landscape as Apple has for its products. So far. We congratulate you to your fine new generation of iPhones, even if one of them has a minor weakness with its casing. But we are deeply disappointed about the lack of respect of your company. Editor in Chief COMPUTER BILD-Group. Please share your comments and write your opinions in the comment box.